With winter right around the corner, you should be well into your planning for your 2017 fundraising events. Meetings take place with staff and board members to discuss everything from budgets, to sponsors, to event strategies and the stewardship of donors. My question, did you spend any time discussing event safety? Most likely not, but you are not alone. It’s the one thing that seems to slide under the radar and is left up to the staff. The reason I mention event safety is I just spent the better part of Saturday discussing safety at my local ski area where I teach skiing to kids on the weekends! Ski areas, as you can imagine, are a liability lightning rod when you consider the risk factors dealing with a very physical activity, over a huge variety of terrains, in cold weather and participants not in peak physical condition. Every year major ski areas deal with hundreds of injuries, from the minor complication to the occasional fatal accident. Because of the unavoidable injuries and risks associated with skiing, a ski area must be prepared to manage emergencies involving crowds of 10,000 skiers or more on any given day spread over thousands of acres in remote wilderness. So now that you are planning your events, spend some time on your event safety plan. To help you, here are ten simple steps to consider when you are reviewing your event safety plan. Have an emergency accident plan. If an emergency takes place at your event do you have a plan to handle the accident? Does your staff know what to do? What about your volunteers? Sit down with your staff, volunteer leadership, board members and, most import, your legal counsel or insurance company to develop a plan that meets or exceeds medical/legal requirements. Have your plan approved by your board and circulate to all staff and board members/volunteer leadership. Develop an injury report. While it’s fresh in everyone’s mind the day of or on Monday; legal action doesn’t get filed for weeks, months and sometimes years later. Who remembers the incident two years later? Maybe the staff person who managed the crisis may not be with your organization two years from now. Have an injury report that gathers critical accident information. What caused the accident, who was present and how was it managed? Get the names and contact information of all the people present, or involved, at the time of the accident. Take statements from witnesses. Sometimes accidents happen quickly so that the injured party leaves without leaving their information to contact them later. Take pictures. Nothing helps the recollection of a situation than having pictures of the accident. Get pictures of the surrounding area. Take pictures of the injury, if possible and the injured person’s identification and their medical/insurance information. Keep this together with the injury report. Your insurance company will ask you for this information. Have an emergency protocol. Every staff person should have a laminated card with instructions on how to manage an accident with emergency numbers on the card. This way they can act quickly, and correctly, especially if it is life threatening. Never have staff or volunteers administer medical treatment if they are not trained or certified as a medical professional. The key is to get medical professionals to the injured person as quickly as possible. Have medical support on site. EMS makes the most sense because they can attend to injuries, are certified locally and can transport to a hospital if necessary. Make sure you know which hospital an injured may be transported to. Have emergency numbers ready so you don’t have to start searching in case of an emergency. There is nothing more stressful than to notify a relative of an accident with a family member and not knowing the name of the hospital. If it is not possible to have EMS on site, securing a doctor, nurse or medical professional might be an alternative and they have the necessary training to attend to an injury or accident. Monitor your entire course. 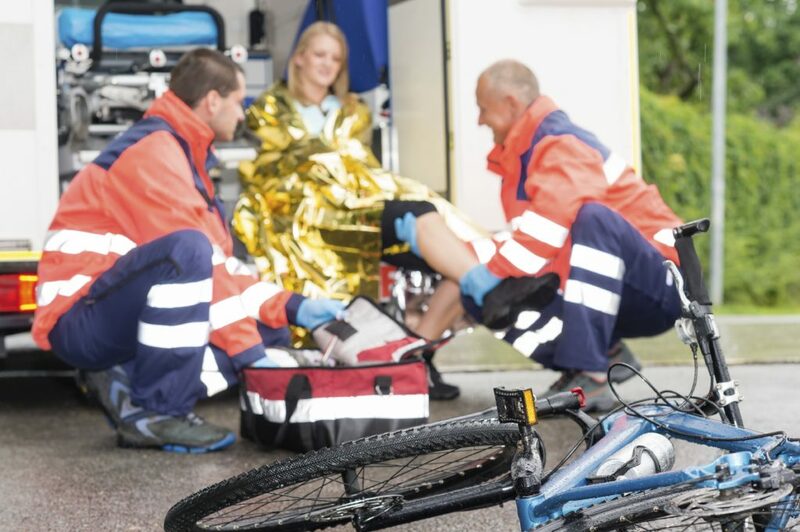 If a person is hurt on your course whether a 5k walk or a century bike ride will medical support be able to get to the person in a reasonable time? Do participants have an emergency number to call if they see an accident? I’ve seen events with courses in parks or on trails where the ambulance could not reach the person because motor vehicles don’t fit on a trail. Know your access points and have a plan to reach remote locations on your course. Know the liability laws in the state your event takes place. Are participant waivers enforceable? Did everyone sign a waiver and can you find the injured person’s waiver if needed. What about children participation and getting parental approval? Some insurance companies will not cover children under a certain age and you should know this before signing up a child that doesn’t meet the minimum age. Your event site and course must be safe. You should review every aspect of your event from a safety perspective. Is the site grounds level and can you access the parking area easily? Is it well lit? Do you have all of the proper permits for your site and the course? What about course support? Do you have, or need, rest stops with food, water, and medical services? If you have medical services, is it well marked and can participants find it on their own if they need help? Are your vendors insured? These are just a few of things to check into. Mark you course and have marshals or police to direct participants. Want to ruin a great event? Have participants get lost and have to find their way back. Marking courses is not hard but can be time consuming when it comes to century bike rides or marathon running. Make sure someone is assigned to this task and has adequate time to complete the job (marking a 100 mile course can take a full day to complete.) If you have lead vehicles do they have a map and know the course inside and out? I’ve seen the lead police vehicles not know which way to go and take a wrong turn. Be polite. Accidents happen and being prepared is half the battle. Another important factor is showing the injured party that you care by taking care of their emotional needs. People handle injuries in different manners, some get emotional, others cry, tough guys don’t want help, family members get scared — so be ready to deal with the situation and show that you care and are in control. A phone call the following week to check on the injured person goes a long way. Caring can be the difference between a one-time participant or a long-term donor or, worse case scenario, a legal claim. In summary, the most important thing is to be prepared and stay calm. If you are the person in charge, and have prepared properly you can manage the situation knowing you have a procedure in place. Emergencies and accidents are an unfortunate part of fundraising events, especially the more physical events. Accidents can happen to participants, the staff, and even the spectators. Know that if you prepare well and have an emergency plan in place then you reduce the risk of serious outcomes or future legal action. So be prepared, take the time now to establish a safety plan and know that your event is prepared for any emergency situation. ← What are the top 10 most effective promotional items?